A Democratic takeover of the House likely would devastate the Republican ranks of the bipartisan Climate Solutions Caucus — though there's disagreement on how much that would ultimately hurt efforts to address global warming on Capitol Hill. Ten of the 28 races The Cook Political Report lists as Republican toss-ups feature GOP members of the caucus, including Reps. Steve Knight of California and Peter Roskam of Illinois. Another four of these toss-up contests are in districts where a Republican incumbent — and caucus member — isn't running for re-election: Reps. Ed Royce of California, Lynn Jenkins of Kansas, Dave Trott of Michigan and David Reichert of Washington. The stakes don't end there. More than a dozen other Republicans who have joined the caucus since its founding in 2016 either are leaving Congress or face some type of challenge in the 2018 midterms, according to analysts at both The Cook Political Report and Inside Elections, two outfits that forecast congressional races. That list includes Republican Rep. Carlos Curbelo, who launched the caucus with fellow Floridian Rep. Ted Deutch, a Democrat. Cook rates Curbelo's chances as better than even, even though his South Florida district backed Hillary Clinton over President Trump by 16 percentage points in the 2016 presidential election. Taken together, a Democratic wave would represent a genuine risk to the membership of the Climate Solutions Caucus. Whether that would actually affect congressional climate legislation is another question. Case in point: Only a handful of the caucus's GOP members voted against a resolution in July that slammed the idea of a carbon tax as "detrimental" to the U.S. economy. Days later, Curbelo introduced his own version of a bill that would place a levy on carbon emissions; just two Republicans since have joined as co-sponsors. Still, there are political advantages to being a member of the Climate Solutions Caucus. Rep. Mia Love (R-Utah), for example, recently cited her association in a mailer to constituents. "Mia Love knows that we need action, not words, on improving our environment," it said. "That's why she regularly engages with her fellow members of the Climate Solutions Caucus to craft and advance policies that promote environmental stewardship." Love faces Democrat Ben McAdams, the mayor of Salt Lake County, in what potentially could be a tight race. Two polls this summer had Love ahead, but neither gave her more than a 6-percentage-point lead, according to RealClearPolitics. Elsewhere, the ClearPath Action Fund, which aims to "elect Republican clean energy champions," has taken out Facebook ads in support of Knight that tout the California lawmaker's membership in the caucus as an example of how he "puts California before party politics." Knight is in a toss-up race against Democrat Katie Hill, an advocate for the homeless. Roskam, who joined the caucus in May, is one of the group's newest Republican members. The six-term Illinois incumbent is in a tight fight with Democrat Sean Casten, who has made the issue of climate change a central theme of his campaign. In August, one of Roskam's aides cited the congressman's role in the Climate Solutions Caucus as one example of how he "has always been a friend to the environment." In Colorado, the campaign of Republican Rep. Mike Coffman — a perennial Democratic target — likewise highlighted Coffman's time in the group earlier this month in response to an attack ad launched against him by the League of Conservation Voters Victory Fund. On a surface level, it's not altogether surprising that a number of Republican lawmakers in the Climate Solutions Caucus face tough races. Oftentimes they represent districts in Democratic-leaning states such as New York, New Jersey and California, where Republicans often are pushed to the political center — and face frequent electoral challenges. "Republicans across the board are facing some pretty challenging headwinds," said James Dozier, executive director of Citizens for Responsible Energy Solutions, a group that advocates for clean energy policy in GOP and conservative circles. But he argued that Republican candidates who "have been incredibly out front on this issue" of climate change are the "ones who are looking really competitive" — maybe when perhaps they shouldn't be given the political environment, he added. One example is Rep. Brian Fitzpatrick (R-Pa.). He's in a competitive race against Democrat Scott Wallace for a Philadelphia-area seat. 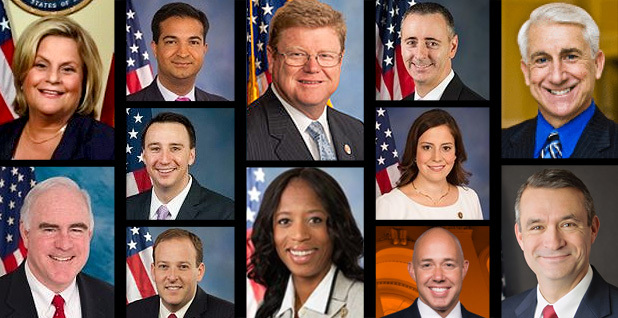 Fitzpatrick is one of the few co-sponsors of Curbelo's carbon tax bill and netted a 71 percent score in 2017 with the League of Conservation Voters. That's tops among House Republicans. Membership in the Climate Solutions Caucus, however, does not translate into a get-out-of-jail-free card from political attacks from environmentalists. Knight of California and Coffman of Colorado both are being targeted by the LCV Victory Fund in part because of their low marks with the group. Coffman had a 6 percent score in 2017, while Knight clocked in at 9 percent. "Anti-environmental House Republicans who try to wrap themselves in a green flag are admitting that their voting records go against the best interests of their districts," Clay Schroers, LCV Victory Fund national campaigns director, said in a statement. "They're worried that their pro-polluter policies will hurt them at the polls — and they should be." Steve Valk, a spokesman with the Citizens' Climate Lobby, said it would be a setback for the caucus if key Republicans such as Curbelo or Fitzpatrick were to lose. But he said he was confident the caucus wouldn't disappear even if a number of GOP members lost their seats this year. "If we were to lose half of the Republicans on the Climate Solutions Caucus, I would feel pretty confident that we would back up to that level again by the middle of next year," said Valk, whose group encourages ideas such as a carbon fee. "I just think the winds are shifting and that Republicans are seeing that it's smart politics for them to be proactive" on climate issues.